The peach is a round, coloured, juicy fruit, typically eaten in summer. Many countries produce peaches, reason why we can eat this fruit all throughout the year. It is used for consumption in fresh and for industry, specially tinned. The peach contributes with modest amounts of vitamin C and provitamin A. Nevertheless, it has a great amount of potassium, phosphorus and vitamin B. The peach is one of the most important fruits, as much in production as in value, belonging to the group of fruits of greater production in the world: apple, citruses and bananas. 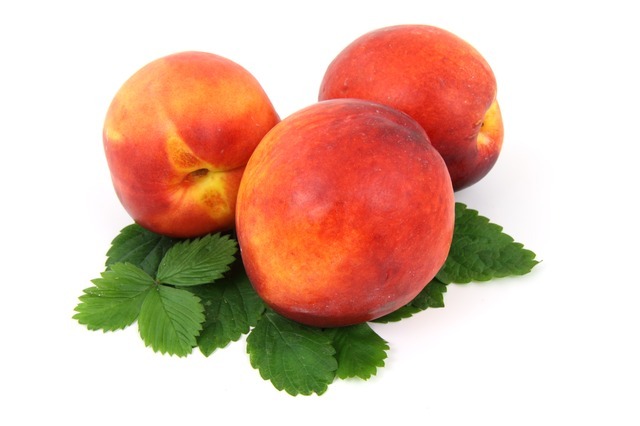 The peach is a type of fruit which is botanically called drupe. Great size, rounded fruit, with a velvet thin and easy to peel skin. Its flesh is between a yellowish and whitish colour, sweet, juicy, giving off a pleasant aroma. Depending on the variety, the stones are broken. Peaches are typical summer fruits; their availability centres between May and September. Nevertheless, we can eat this juicy fruit off-season thanks to producing countries such as China, Italy, Greece, Israel, South Africa and Spain. The peach is a versatile fruit that can be used to garnish meats, stewed fruit, jams, etc. According to the type of fruit there exist two groups: those with soft flesh, freestoned, destined for consumption in fresh, and those with firm flesh, strongly adhered to the stone and destined both for consumption in fresh and for the industry, preferably for tinned fruit. A very important peach variation is the nectarine, deeply spoken about in another chapter, although we can advance that it is a hairless peach, obtained by genetic mutation from the down’s gene to the gene of smooth skin. Besides, they are lively coloured (between bright red and yellow) and are usually small. Contrary to what people think, nectarines are not crossings between a peach and a plum. It is an spontaneous variety of peach; peaches and nectarines are genetically equivalent. Within the species to which the peach belongs, there is also another well-known variety, the Paraguayo. There also exist white pulp varieties, with or without streaks, with greenish and/or reddish grooves, yellow flesh, total or partially adhered to the stone. Varieties such as the pavia type, with a hard or semi hard flesh adhered to the bone, are also well-known. There are many varieties that are renewed from one year to the other. The different varieties are classified depending on the final market, whether it is for consumption in fresh, or for the industry. Every year, new varieties appear in all the world prepared to be used by the producers, specially in France, Italy and Spain. New varieties are continuously launched to the market; the rate of technical progress is so fast that producers are forced to create new plantations, with shorter and shorter producing cycles, so a new variety can offer better commercial yields. What can be deduced is that there is a wide range of varieties, although the criteria that the producer must apply at the time of choosing a variety are varied: the maximum adaptation to the microclimate to which it is destined, the type of soil and water available, the time of flowering, etc. A way to study the peach varieties is by grouping them according to the fruit characteristics. Thus, they will be classified mainly in two groups: peaches for consumption in fresh and for the industry. 1- the varieties " for the consumption in fresh’ are usually characterized by a firm flesh, due to commercialization requirements, but at the same time it melts in the mouth and it is pleasant for the palate. The fruit pulp does not adhere to the stone, the skin is bright red, attracting the consumer, and the size is medium to large. - The fruit pulp must have an intense yellow or orange colour without any red tones. - The fruit pulp must be firm so that it bears the baking without losing its structure. - Small round adherent stone, that adapts to be mechanically stoned. - Average size fruit between 19 and 21 cm of circumference and regular spherical shape. As previously commented, the availability of peaches lasts throughout the year, although it centers in the summer months.